Should I Spend Donuts on the Fireworks Factory? Out with the old and in with the new! Yesterday morning Itchy and Scratchy Land exited stage left and the Poochie mini-event arrived stage right! Because 6 weeks of Itchy and Scratchy wasn’t enough. Of course, an all-new mini-event means a new opportunity for EA to add new premium items to our stores! This is one of those If you like it get it items. The animation is great, but it’s REALLY frustrating that there are no tasks there once the questline is over. EA spends time making a great animation then has no way of allowing the building to be reanimation. REALLY frustrating. Of course, in the end, it’s your decision, we can only tell you what we would or wouldn’t do…and as a premium player, I’m still on the fence. The no task there really has me annoyed. But whatever you decide, just make sure you make your final decision before it leaves our games for good (or for now). Milhouse: Bart, come quick! They just build a Fireworks Factory! Bart: Seen a lot of factories, Milhouse. Bart: Abandoned?! Why didn’t you say so? Milhouse: I thought the exciting part was the fireworks. Bart: Whoa! That was a tone of fireworks! Bart: Because if you were in there with me, it wouldn’t be ABANDONED anymore. And that would take away all the fun. Milhouse: So you’re saying I’m the reason it was so cool??? Bart: Yeah, sure..definitely didn’t have anything to do with the awesome explosions. Milhouse: Wow, I helped fulfill a criteria for Bart to be able to have fun! 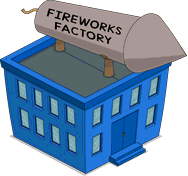 What are your thoughts on the Fireworks Factory? Will you be spending the donuts to bring it to your Springfield? Did you already? Why or why not? Where have you placed it in your town? Sound off in the comments below, you know we love hearing from you! This entry was posted in Buildings, Donuts, Poochies Dog Dayz, Should I Buy, Tips and Tricks, Updates and tagged Fireworks Factory Size, Should I Buy the Fireworks Factory, Tapped Out Itchy and Scratchy, Tapped Out Tips and Tricks, Task at the Fireworks Factory, The Simpsons Tapped Out, TSTO Addicts, TSTO Poochies Dog Dayz Mini Event, TSTO Tips and Tricks. Bookmark the permalink. Wow. The animation goes away…. Good while it lasted? :~) What a joke to rob me (and us) of the animation. Bogus… Cool looking building that gives me a few bucks for a low donut price at least though. EA should fix the issue IMO and let it “light up” with a task for sure. The sooner the better. No animation after initial quest = dealbreaker. It locked up after Bart completed the task, so it’s stuck with a red slash on my task bar. Frustrating, would ask for my Donuts back but still have plenty. Still annoying though. Try storing it and pulling out again…sometimes that helps if it gets stuck. Also, are you missing a character or building needed for completion of a task? I don’t understand why they couldn’t keep the same task, it was alrEAdy programmed, I’d understand if it wasn’t already there. I bought it but I have mixed feelings about it. The funniest part about it in the episode was millhouse whining when are they getting to the fireworks factory. Honestly a sign this way to the fireworks factory with a 2% bonus would have made more sense. Still bought it still like it. Just mixed feelings from a canon standpoint. Hubbys game is stuck at the land token. Hes got 300/300 script and all the other 5/5s are done and it won’t award him the land token so he can move on. And his characters cant be sent for the last car prize. Cleared cache, force stopped it…. Anyone know whats up? Pleez dont say contact EA. PLEEZ!!! Try uninstallling and reinstalling. Worked for another player, see Open Thread. I want to want it… But there’s really nothing there for me. I’m going to be redesigning my ichy and scratchy land this week so maybe.. if I have a spot for it..
Random but I just finished the event and tapped on the screen just a picture of Homer popped up. Does anyone remember/know what the popup said? You knew there had to ba a donut in there somewhere😄. Amazing what people will do to their pets… I remember trying to dress up our dog when I was 5 or 6; the dog was definitely not amused, and my mother told me off as well. My cat wouldn’t stand for it, for sure. She’s very sweet, but you just have to draw the line somewhere with these crazy humans🙀. Seems like a building that LT Smash might animate (aka babysitter bandit and wise guy). Not gonna go for this one, tho, just doesn’t have anything exceptional…another square box. Hi, neighborino. I don’t think it’s a glitch. It might be EA’s intention so as not to waste the animation but still save device resources. If you stay in one section of the town long enough, all buildings become animated (this is not always the case, though). This is neat because there are so many animated buildings I have long forgotten because I don’t know which characters use what. Reasonably priced, I purchased it as an appropriate addition to my Explosion Land in ISL, but the animation deal is good cause for pause. Then again, there are plenty of premium Decorations without animations. I am hopeful some Jobs will be added later. EA has done so before with overlooked Buildings. Really? After the initial use, no ongoing quest to animate? It’s hard to say. There’s a ton of buildings with fun animations that never got a permanent task. And there are some that did.